The Minister of Foreign Affairs, International Cooperation and External Trade, Bruno Leingkone, has appointed Suren Abeywickrema as the Honoary Consul of the Republic of Vanuatu to Colombo, Democratic Socialist Republic of Sri Lanka, with jurisdiction of the state of Sri Lanka. Minister Leingkone made the appointment in accordance with the Republic of Vanuatu Foreign Service Act No.20 of 2013, Part 5 Article 21 (1). 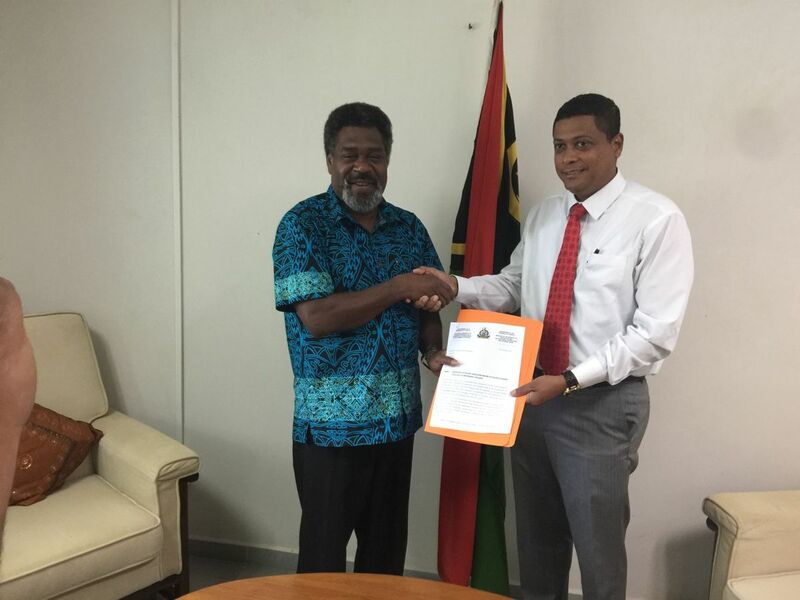 “As Honorary Consul, the government and especially the Ministry of Foreign Affairs will require you to assist the Republic of Vanuatu in strengthening the relationship between the two countries, promoting trade, tourism and investment opportunities and provide consular assistance to Vanuatu Government officials and Ministers travelling through Sri Lanka and Vanuatu residents in Sri Lanka,” Leingkone said. Honorary Consul Suren Abeywickrema will report directly to the Minister, the Director General of the Ministry of Foreign Affairs on the performance of his duties and work program of the honorary consul as provided for under Article 25 of the Foreign Service Act. The new consul, Abeywickrema reiterated that this was an opportunity for Vanuatu to benefit from in terms of investment in the different sectors of the country. “Sri Lanka and Vanuatu are both island countries and there sectors especially in tourism where Sri Lankan government can help by attracting foreign investors from Sir Lanka to come to Vanuatu and boost this industry and also i will help to facilitate Vanuatu citizens, government officials in Sri Lanka -facilitate for business people in Vanuatu to meet up with the business community of Sri Lanka and vice versa. Mr Suren Abeywickrema says he has over 25 years of business experience as CEO / Director in many large corporations, he was also the former CEO/Director of Carpenter Group in Vanuatu and Solomon Islands and is currently owner, CEO and Jt.Managing director of Paradise Group which has business in Sri Lanka, Vanuatu, Solomon Islands and Japan, apart from it he sits on the board of well reputed companies such as McLarens Holdings Limited Sri Lanka. Mr Suren Abeywickrema is a Chartered Marketer from Chartered Institute of Marketing UK and is a Fellow of the CIM UK, he is a Fellow Member of the Sri Lanka Institute of Marketing, a Fellow Member of the Australian Institute of Management, Post Graduate holder, A management accountant from the charted institute of management accountants (ICMA) and has a Master of Business Administration from Australia. © 2017 Paradise Motors (Pvt) Ltd.